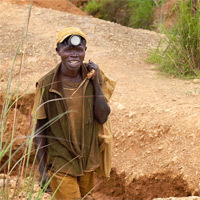 The violent conflict in eastern Congo is being facilitated by a trade in conflict minerals that is worth hundreds of millions of dollars per year. Armed groups mine and sell the minerals on the international market in order to purchase arms and maintain their control over the region. Tin, tungsten, tantalum and gold—the minerals specified in the SEC’s rules—are critical to industrial and technological products worldwide, including mobile telephones, laptop computers, aircraft, industrial machinery, and digital video recorders.